1THE SECOND PARABLE, respecting these who deny the Name of the habitation of the holy ones, and of the Lord of Spirits. 2Heaven they shall not ascend, nor shall they come on the earth. This shall be the portion of sinners, who deny the Name of the Lord of Spirits, and who are thus reserved for the day of punishment and of affliction. 3In that day shall the Elect One sit upon a throne of glory; and shall choose their conditions and countless habitations, while their spirits within them shall be strengthened, when they behold MY Elect One, for those who have fled for protection to My Holy and Glorious NAME. 4In that day I will cause MY Elect One to dwell in the midst of them; will change the face of heaven; will bless it, and illuminate it for ever. 5I will also change the face of the earth, will bless it; and cause those whom I have elected to dwell upon it. But those who have committed sin and iniquity shall not inhabit it, for I have marked their proceedings. My righteous ones will I satisfy with peace, placing them before me; but the condemnation of sinners shall draw near, that I may destroy them from the face of the earth. 1There I beheld the Ancient of Days, whose head was like white wool, and with HIM another, whose countenance resembled that of man. His countenance was full of grace, like that of one of the holy angels. Then I inquired of one of the angels, who went with me, and who showed me every secret thing, concerning this SON OF MAN; who He was; whence He was and why He accompanied the Ancient of Days. 4He shall hurl KINGS from their THRONES and their DOMINIONS; because they will not exalt and praise HIM, nor humble themselves before HIM, by whom their kingdoms were granted to them. The countenance likewise of the mighty shall He cast down, filling them with confusion. Darkness shall be their habitation, and worms shall be their bed; nor from that their bed shall they hope to be again raised, because they exalted not the NAME of the LORD of SPIRITS. 6And with HIM the faithful, (43) who suffer in the NAME OF THE LORD OF SPIRITS. (43) Shall expel Him…the faithful. Or, “will be driven from the houses of His congregation, and of the faithful” (Knibb, p. 132; cp. Charles, p. 131). 1In that day the prayer of the holy and the righteous, and the blood of the righteous, shall ascend from the earth into the presence of the LORD OF SPIRITS. 3At that time I beheld the ANCIENT OF DAYS, while HE sat upon the throne of HIS glory, while the book of the living was opened in his presence, and while all the powers which were above the heavens stood around and before HIM. 4Then were the hearts of the saints full of joy, because the consummation of righteousness was arrived, the supplication of the saints heard, and the blood of the righteous appreciated by the Lord of Spirits. 1In that place I beheld a fountain of righteousness, which never failed, encircled by many springs of wisdom. Of these all the thirsty drank, and were filled with wisdom, having their habitation with the righteous, the elect, and the holy. 4He shall be the HOPE of those whose hearts are troubled. All, who dwell on earth, shall fall down and worship before Him; shall bless and glorify Him, and sing praises to the NAME of the LORD OF SPIRITS. 6In HIS presence He existed, and has revealed to the saints and to the righteous the wisdom of the Lord of spirits; for he has preserved the lot of the righteous, because they have hated and rejected this world of iniquity, and have detested all its works and ways, in the NAME of the LORD OF SPIRITS. 7 For in His NAME shall they be preserved; and His will shall be their life. In those days shall the kings of the earth and the mighty men, who have gained the world by their achievements, become humble in countenance. 9 I will cast them like hay into the fire, and like lead into the water. Thus shall they burn in the presence of the righteous, and sink in the presence of the holy; nor shall a tenth part of them be found. 10 But in the day of their trouble, the world shall obtain tranquillity. 1 Wisdom is poured forth like water, and glory fails not before him for ever and ever; for potent is He in all the secrets of righteousness. 2But iniquity passes away like a shadow, and possesses not a fixed station: for the Elect One stands before the Lord of Spirits; and His glory is for ever and ever; and His power from generation to generation. 3With Him dwells the spirit of intellectual wisdom, the spirit of instruction and of power, and the spirit of those who sleep in righteousness; He shall judge secret things. 4Nor shall any be able to utter a single word before him; for the Elect One is in the presence of the Lord of Spirits, according to his own pleasure. 1In those days the saints and the chosen shall undergo a change. The light of day shall rest upon them; and the splendour and glory of the saints shall be changed. 2In the day of trouble evil shall be heaped up upon sinners; but the righteous shall triumph in the name of the Lord of spirits. 3 Others shall be made to see, that they must repent, and forsake the works of their hands; and that glory awaits them not in the presence of the Lord of spirits; yet that by His NAME they may be SAVED. The Lord of spirits will have compassion on them; for great is His mercy; and righteousness is in His judgment, and in the presence of His glory; nor in His judgment shall iniquity stand. He who repents not before Him shall perish. 4Henceforward I will not have mercy on them, saith the Lord of spirits. 1In those days shall the earth deliver up from her womb, and hell deliver up from hers, that which it has received; and destruction shall restore that which it owes. 2He shall select the righteous and holy from among them; for the day of their salvation has approached. 3And in those days shall the Elect One sit upon His throne, while every secret of intellectual wisdom shall proceed from His mouth, for the Lord of Spirits has gifted and glorified Him. 4In those days the mountains shall skip like rams, and the hills shall leap like young sheep (46) satiated with milk; and all the righteous shall become like angels in heaven. 5Their countenance shall be bright with joy; for in those days shall the Elect One be exalted. 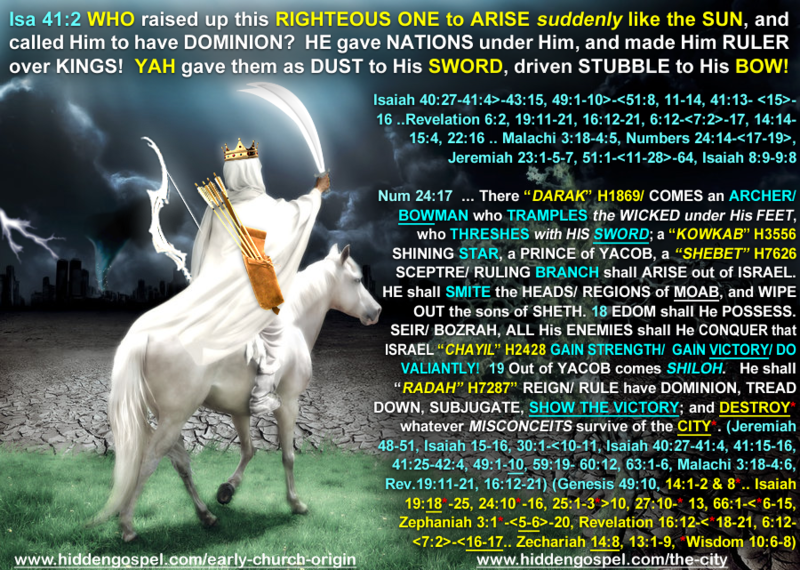 The earth shall rejoice; the righteous shall inhabit it, and the elect possess it. 2The Lord of spirits sat upon the throne of His glory. 3And the Spirit of Righteousness was poured out over Him. 11He shall sow the congregation of the saints, and of the elect; and all the elect shall stand before Him in that day. 2They shall bless and glorify the Lord of spirits, saying, Blessed is the Lord of spirits, the Lord of kings, the Lord of princes, the Lord of abundance, the Lord of glory, and the Lord of wisdom. 4Your power is from generation to generation; and your glory for ever and ever. 6Now we know, that we should glorify and bless the Lord of kings, Him who is King over all things. 8And now small is the rest we desire; but we do not find it; we reject, and do not possess it. Light has passed away from before us; and darkness has covered our thrones for ever. 10In the day of our suffering and of our trouble He will not save us, neither shall we find rest. We confess that our Lord is faithful in all His works, in all His judgments, and in His righteousness. 11In His judgments He pays no respect to persons; and we must depart from His presence, on account of our evil deeds. 12All our sins are truly without number. 14But that prevents us not from descending to the flaming womb of hell. 15Afterwards, their countenances shall be filled with darkness and confusion before the Son of man; from whose presence they shall be expelled, and before whom the sword shall remain to expel them. 16Thus saith the Lord of spirits, This is the decree and the judgment against the princes, the kings, the exalted, and those who have possessed the earth, in the presence of the Lord of spirits. HalleluYAH! Shalom! About three years of almost nightly blogs at http://www.blogtalkradio.com/edy1. Yep, its direct call-in show where you can get answers to the anything you find of interest at http://www.hiddengospel.com I can also be reached directly at hiddengospelsite@yahoo.com ed.ymiah@facebook.com Shalom!